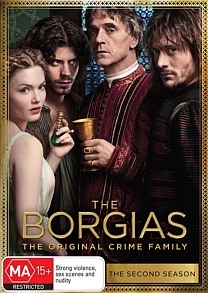 The Borgias the Second Season DVD Review The Borgias continues to make great use of its rich period setting. This is drama on a grand scale. There is enough intrigue, betrayal, action and melodrama in The Borgias to rival the best moments of 2010’s outstanding miniseries, The Pillars of the Earth. Season 2 sees Pope Alexander VI juggling a multitude of threats, from both within and without his stronghold in Rome. His daughter Lucrezia is faced with the prospect of finding a husband again, after the failed marriage to Giovanni Sforza. His two sons, Cesare and Juan, continue to play out a bitter rivalry, while his mistress and ex-lover come together in an attempt to stop corruption within the Vatican. There is a large ensemble of characters, each coming and going from the series as his or her individual story arc slowly simmers away. Most enjoyable is watching the interplay between all of the conflicting factions: There’s King Charles of France on one side, the defiant Sforza clan on the other, the Borgias themselves, and a renegade group of priests who have ambitions of lopping the gilded head off the Catholic church. There are only ten episodes, but each one furthers the story in some way, and it never feels like filler. The character of Rodrigo Borgias has many different sides. A will to see Rome restored to its vibrant former self and a profound love for his family, are often at odds with bloodthirsty ambition and a ravenous appetite for pleasure. Jeremy Irons is great in this role, as he appears to have mellowed somewhat with age. Had he played Borgia earlier in his career, he might have come across as an outright tyrant; but here he looks completely natural, even likeable. Although he commits despicable acts on screen, it’s ever so hard to despise him. And that’s the way with most of the characters: They’re so hard to hate. Even the worst of them still has some inkling of a redeeming quality, and it makes watching The Borgias a true tug of war for your mind. The world of the Borgias: This is made up of several short featurettes, each dealing with a different aspect of the historical setting, such as gunpowder, the Renaissance, and the Catholic Church. These are interesting, but a lot of the footage repeats from one featurette to the next. ?The art of fencing: An expert in real-life fencing takes us through the important differences between sword-fighting in reality, and sword-fighting for the camera. ?Instruments of torture: A grisly, but entertaining, examination of the various methods of torture in Renaissance Europe. ?The Borgia poison: Poison plays so prominent a role in the Borgias that it’s almost an extra character. Here, an expert explains the real-life version, and gleefully tells you how long you’d have to live after ingesting the substance. The Borgias continues to make great use of its rich period setting. This is drama on a grand scale.